The Dodge Challenger SRT Hellcat, aka – American Muscle, is not just your average vehicle. Built for performance, the Dodge Challenger SRT Hellcat was created with precision detail and a knack for power. So how does this vehicle fit in to the world of practicality? We aren’t quite sure that it does, but before we make any rash decisions; why don’t we just take an in-depth look into the world of the Dodge Challenger SRT Hellcat. What powers this beautiful machine? Putting power aside, advancements in highway fuel efficiency power Challenger into the future with up to 30 highway mpg (miles per gallon). Thanks to the 3.6L Pentastar V6 engine, TorqueFlite eight-speed automatic transmission, electric power steering, aluminum axles and advanced driveline components, you can rule the road without chugging fuel. Now we mentioned TorqueFlite, if you aren’t familiar with TorqueFlite, it’s essentially an eight-speed automatic transmission that features exceptionally close fifth- through eighth-speed gear ratios along with a lower cruising rpm in top gear. As far as other performance matters go, the Dodge Challenger SRT Hellcat features all-speed traction control that helps maintain traction and stability by applying brake pressure to slipping wheels and reducing engine power when needed to help the tires regain traction. It also has a rear-wheel-drive design and a near 50/50 weigh distribution that creates a thrilling driving experience. During acceleration, weight shifts to the drive axle to boost down-force and traction. On top of that, it has lighter-weight cast aluminum axles and housings that help reduce weight and friction compared to previous generations. The housing also includes a four-bolt design for increased durability. Now, one of the more noticeable and iconic features on the SRT Hellcat is its Brembo six-piston brake system. Standard on the Challenger SRT, T/A 392 and SRT Hellcat, the largest front-brake system ever in an FCA US vehicle, featuring 390-mm Brembo two-piece rotors with six-piston calipers. Combine this brake system with an independent short-/long-arm front suspension and five-link independent rear suspension (of which, both feature coil springs, gas-charged monotube shock absorbers and stabilizer bars) and you have yourself a vehicle that can deliver extraordinary handling, ride and comfort that you expect in a remarkable vehicle like Challenger. How does the exterior line up with the performance? There’s no mistaking classic. Classic was cool yesterday, and it’s cool today. Purists’ performance cues like iconic and retro colors make every Challenger model a beacon of cool. Looking back only to go forward and fast, this generation is badder than ever. With sleek designs, dual rear exhaust tips and 20-inch wheels, these muscle machines seize the street. The throwback design really maximizes the hype behind this vehicle. Unmatched customization means a mighty 16 interiors to choose from, so you can outfit your challenger in retro style or modern luxury. The Dodge Challenger offers loads of interior space and seating for five adults. With a Dual-Zone Automatic Temperature Control standard on all models, you need only set your preferred temperature once to stay comfortable, no matter what the weather. However, if things get too hot in the challenger, you can keep your cool with available ventilated front seats. The Challenger also offers Dodge Performance Pages. Available with the Challenger, Dodge Performance Pages offer real-time stats, from engine performance to the actual exerted g-force of your vehicle. To help with performance and safety, the Challenger also has an available adaptive cruise control, that automatically adjusts cruising speed and maintains a set distance between your vehicle and the one in front, to help avoid a collision. In conjunction with adaptive cruise control, the Challenger has an available electronic shift. The TorqueFlite eight-speed automatic transmission features an electronic shifter. Or choose a six-speed manual transmission, standard with the 5.7L or 392HEMI V8 engine. 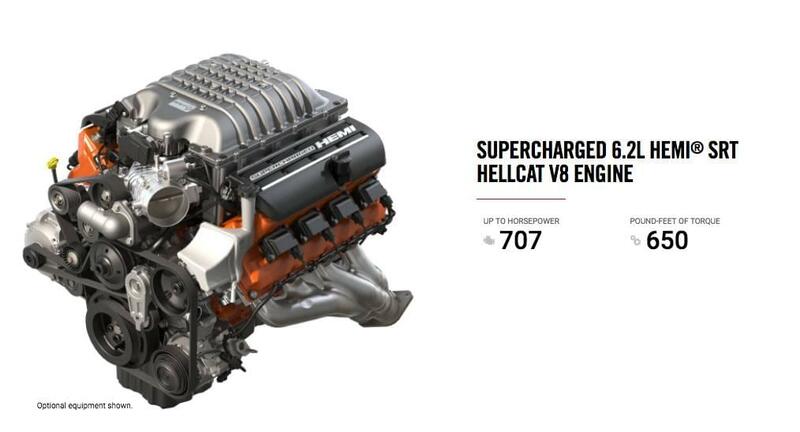 All-in-all, it is clear to see that the Dodge Challenger Hellcat SRT is one fine tuned machine. It comes with almost every performance option you can think of in todays modern muscle. The fine body lines and curves, matched with it’s bad boy look gives this vehicle a one of a kind feel when behind the steering wheel. That in mind, if you have any questions at all, we have an excellent team of qualified product specialists here to assist you with any inquiries you may have on the Dodge Challenger Hellcat SRT. Contact us today! For more information on the Dodge Challenger SRT Hellcat, visit our website and check out our SRT Hellcat we have for sale on the showroom floor. As always, we personally want to thank you for taking the time to read our blog and we look forward to bringing you more Dodge, Jeep, Ram & Chrysler content in the near future. Stay tuned and don’t forget to share us with your friends and family.